Kulturforum, as the name suggests is the cultural hub of Berlin. Musikinstrumenten Museum is a part of the Kulturforum and is a must visit for music lovers. 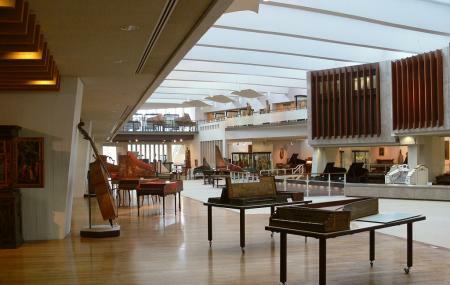 If you play an instrument, then you should definitely be visiting this museum. There are instruments kept from the oldest times to the most recent times with a lot of documentation supporting the information of these musical instruments. All in all it is a great place to explore and understand the basics of musical instruments and also witness a whole of them under one roof. Children visiting the museum should be under the guidance of their parents. For annual ticket details – visit official website. How popular is Berlin Musical Instrument Museum? People normally also visit Fuhrerbunker while planning their trip to Berlin Musical Instrument Museum. The library was a very good place to work on my research, very helpful staff, quiet atmosphere, a lot of documentation and historical resources. Extremely rude staff. Enthusiastically arrived at 3:50pm and was impatiently told to go away as closing was at 5pm. The collection is actually really good, and the museum has a lot of potential. Unfortunately the staff hasn't been very helpful, and the museum lacks of interactivity. It still worth a visit, but remember to get the audio guide, there's no other way to learn something. Ok, it is an amazing collection, but what an unhelpful and unfriendly welcome. I am a curator and already have an interest but it pains me to see such great potential undermined by woeful visitor services and interpretation. Go along - the place needs your support - but tell them they need to improve their offer or they will wither and die. It's awesome music instruments museum ever. They collect very complete collection from rennaissance until now. But mostly they collect so many rennaisance and baroque instruments. So many old instruments there to get to know the history and sounds you could just ask the audio guide. The price is 6€ include audio guide in german or english. It's really recomended place in Berlin for classical musician.